Number and width of lanes depends on dance floor size and number of couples. Pedestrians: Yield to dancing couples! Do not just dance into gaps where ever there is space. This only causes chaos. Do not start with a backward step. 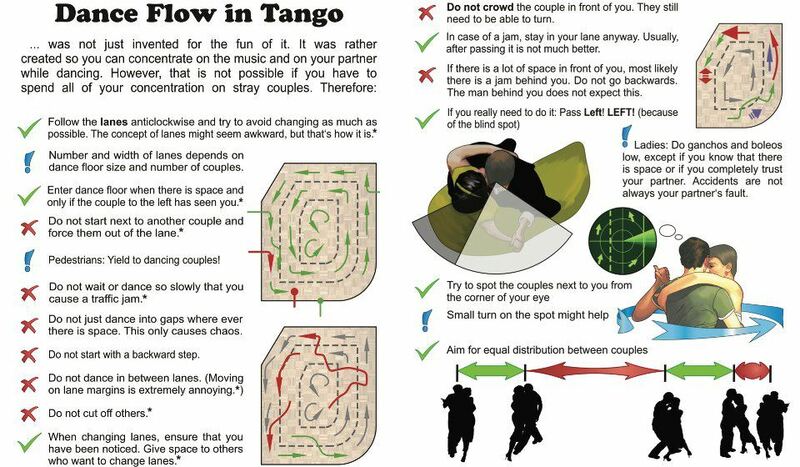 Do not crowd the couple in front of you. They still need to be alone to turn. In case of a jam, stay in your lane anyway. Usually, after passing it is not much better. If there is a lot of space in front of you, most likely there is a jam behind you. Do not go backwards. The man behind you does not expect this. If you really need to do it: Pass Left! LEFT! (because of the blind spot). Ladies: Do ganchos and boleos low, except if you know that there is space or if you completely trust your partner. Accidents are not always your partner’s fault. Try to spot the couples next to you from the corner of your eye. Small turn on the spot might help. Aim of equal distribution between couples.